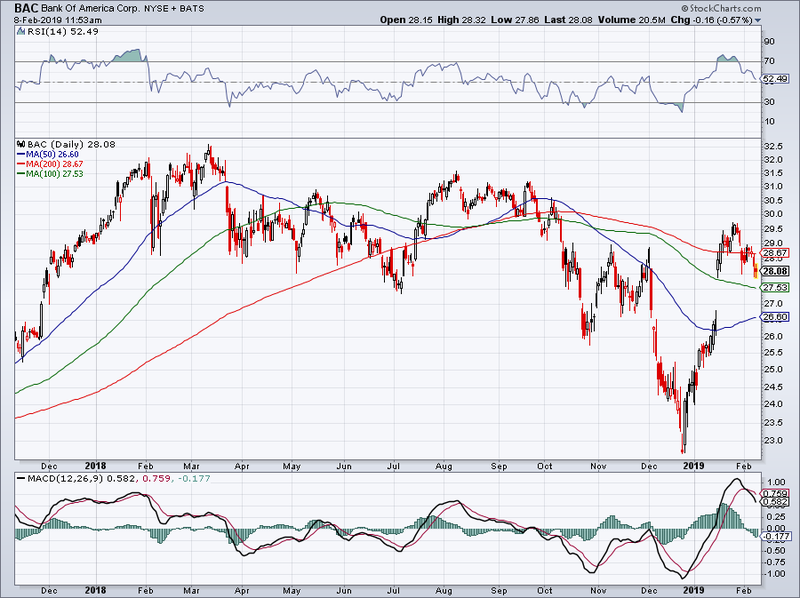 Buy Bank of America After Buyback Boost? Bank of America stock is struggling to rise, even though it bumped its already sizable buyback plan by 12.5% or $2.5 billion. Bank of America (BAC - Get Report) shares started off lower on Friday, despite the company announcing a $2.5 billion boost to its share repurchase plan. Shares closed down 5 cents, or 18%, at $28.29. If management is buying, should investors buy, too? Unfortunately, share buybacks don't always mean the stock is cheap or undervalued. There's a long list of companies that ramped up, initiated or continued their stock buyback program at prices that proved to be disastrous in hindsight. With Bank of America, though, hopefully that's not the case. Investors need to remember that after hitting $29.50 in late-January, Bank of America stock was about $7 per share or more than 30% off its December lows. Even ignoring the capitulation bottom on Christmas Eve, the stock spent a decent amount of time below $25. While rising interest rates would typically benefit a company like Bank of America, as it can make more money off its very large collection of customer deposits, it also reduces the spread between long- and short-term bonds. That's not good for banks and as such, has kept a lid on the stock prices over the last six months or so. Still, if conservative investors can get in an attractive price -- say at ~$26.50 near the 50-day moving average -- they may find Bank of America an advantageous position going forward. Clearly the buyback hasn't helped the stock price that much over the past year, so don't count on this bump helping much either. But if you like Bank of America stock for its fundamentals, buy it for its fundamentals, not its buyback. Bank stocks continue to struggle, as valuations remains low amid ballooning profits. For instance, JPMorgan (JPM - Get Report) reported a record year of income, yet can't even whiff its 52-week high and is struggling to stay north of $100 as we speak. Bank of America isn't all that different. The company previously announced a $20 billion share buyback plan last June, with plans of completing it by June 2019. The banks essentially work in a year-by-year capital distribution structure due to financials stress tests from the Federal Reserve. For Bank of America to give a 12.5% bump to its buyback with just a few months left before June 2019 says that management believes its stock is being unfairly discounted. At less than 10 times 2019 earnings estimates, it's not hard to see why. The company had solid growth in 2018 and that's expected to continue into 2019. While revenue estimates call for 2.7% and 2.6% growth in 2019 and 2020, respectively, earnings expectations call for 10.3% and 10.4% growth in those years, respectively. While fiscal 2020 is a long ways out from here, in Wall Street's eyes anyway, 10% earnings growth on low-single-digit sales growth is nothing to scoff at, particularly for a stock at 10 times earnings paying a 2.1% dividend yield. Keep in mind that a one-year $22.5 billion buyback is no small sum for any company, particularly for a company with a $273 billion market cap. Should BAC announce a similar buyback later this year, we're talking quite a bit of stock being taken off the open market.